Update: September 2, 2014 - Our winner is Cristea Diana. Please send us a message on our Facebook page with your contact info. I'm hosting my first giveaway at I Am a Woman in Love. It's really easy and I know you're going to love this. All you have to do is have some fun. Leave your opinion in a comment down the page and you could win the necklace in the picture above. Which one of the following dresses would you wear to a wedding? Answer in a comment with the number of the dress. You can also argue why if you'd like. 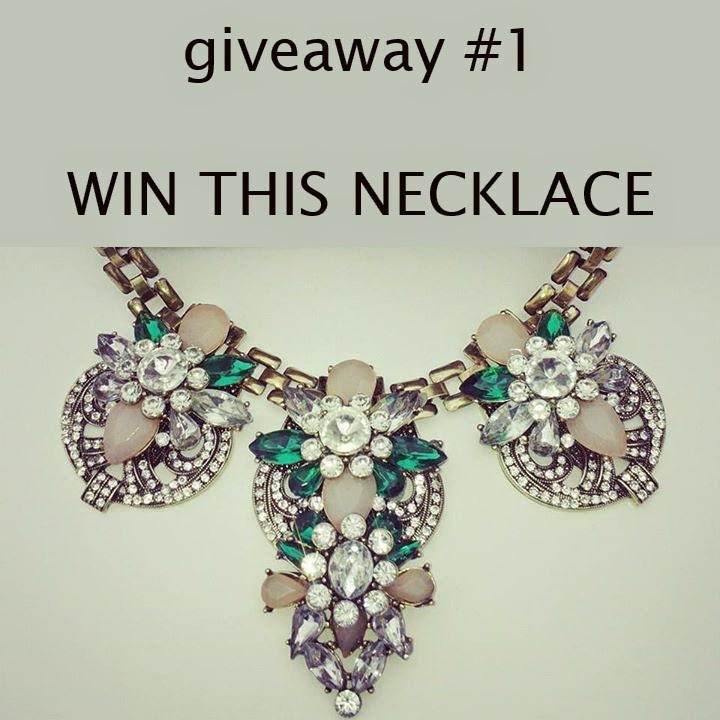 You have until September 1st to enter this contest to win the necklace above. I will use random.org to draw the winner. September 2nd I will post the winner on the Facebook page, so don't forget to check it out! Winners will have until 12pm noon September 3rd to leave their contact via a message on our Facebook page to receive the prize. 2. Red is always a perfect option. 3. Black is always the best choice for any occasion because it is a proof of elegance and it put us in a sophisticated light. i would say number 3 because it is a really nice blue, very elegant and that glitter/tinsel will catch anyone's attention. I also like that it is half strech so it puts your curves in a great light but you can also move and danse wearing it. And if you don't have such big bust, the part on the neck will totally help you ( and as a tip you can also wear it with a bra). And i will tell also why you shouldn't choose the others. The first one is not suitable if you don't have a bee waist or big bust and also it seems to me that kind of material easy to crush and very visible if stained. The second one is also not suitable if you are just a weeding guest because red dresses at weedings are in my opinion just for godparents or maybe mother of the bride. And i also don't like the neck wich will irritate you and that floral thing is way too big. If you don't have big bust is also unsuitable. So in the end the best choice would be the 3rd one!